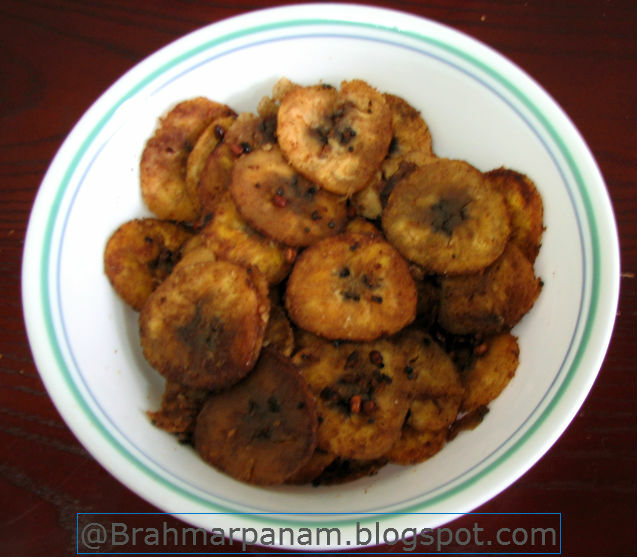 Vaizhaikai / Raw banana stir fry is a very tasty side dish that goes well with Sambar / Rasam rice. This recipe serves 3. Cut the ends of the raw banana and then cut it into 2 halves. Pressure cook the raw banana for 1 whistle or until cooked but firm. Peel the skin of the Raw banana and slice it into thin rounds. Heat oil in a wok and add the mustard. When it starts spluttering add the Urad dal. When the dal turns a golden brown add the asafoetida and the sambar powder. Add the cooked raw banana and stir carefully so as to not break or mash the bananas. Cook on medium flame for 10-15 min stirring only occasionally till it becomes crisp. Sprinkle the Salt and stir well. Cook for a few more min and serve.